How do you respond after an opposing team takes an early lead in a game? Are you able to respond in a positive manner and focus on your game or do you succumb to the pressure of playing from behind? 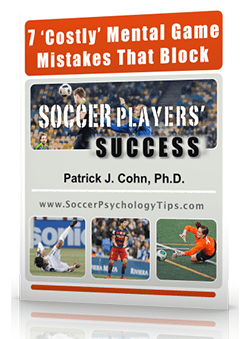 Often in soccer, an early goal by your opponents in a game can create a heightened sense of pressure. 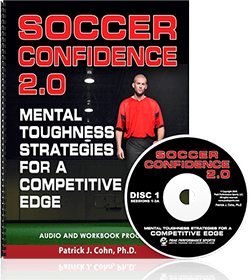 The result is that your desperate play gives your opponents a tremendous advantage as they dictate the action on the pitch. Many coaches preach to their teams to play with a sense of urgency when trailing in a game. But what does a sense of urgency mean? Some athletes think a sense of urgency means playing harder which often leads to reckless play and poor decision making. Playing with a sense of urgency is a combination of hustle, focus and execution. Playing with a sense of urgency is increased effort but within the framework of the game plan. A great example of responding negatively to trailing in a game is Brazil’s 2014 semi-final World Cup match against Germany. Germany advanced to the FIFA World Cup Final with a dominating 7-1 victory over Brazil. 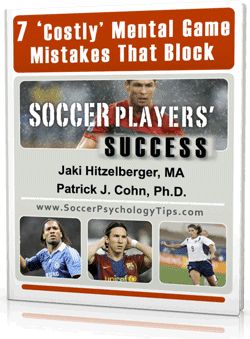 Germany set the tone early scoring eleven minutes into the game. Twelve minutes after their first goal, the Germans put on an offensive clinic scoring four goals in six minutes. During Germany’s scoring barrage, host-team Brazil lost their focus and appeared frazzled for the duration of the game. Brazil never recovered and was ousted from the World Cup in demoralizing fashion. Germany coach Joachim Low thought the Brazilian team was overcome by the pressure of the situation and conceded the loss even before the game was over. Germany midfielder Toni Kroos felt the Brazilians played anxious and back on their heels affecting their decision-making and play on the field. Brazil coach Luiz Felipe Scolari said his team was overwhelmed and lost their focus after they trailed Germany early in the game. Keep your composure. That may sound easier-said-than-done but take a few deep breaths. Communicate calmly with your team and follow the game plan. Stay focused on one play at a time. Stay in the present and look for your current opportunities instead of trying to do too much. You should practice different game-type scenarios during scrimmages… and remember that your mindset in these practice situations will gradually seep into your play during games. When you’re behind the pressure really sets in. Either you fold under that pressure or you thrive! It’s important to remember that the game is never over until the whistle blows. Don’t panic over the score, focus on what you can control is that moment.